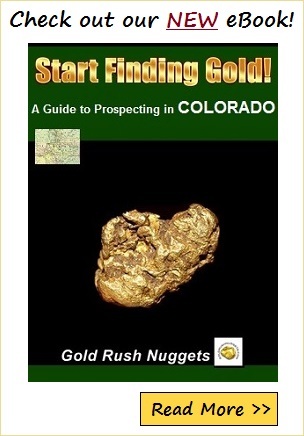 Colorado is a fantastic state to prospect for gold. It ranks as one of the leading producers of gold in the U.S. Rich gold deposits have been found throughout the state, with the significant discoveries being located in the more mountainous western half of the state. Zebulon Pike reported gold in Colorado in present day Park County, Colorado as early as 1807, but it wasn’t until rich discoveries near Denver in 1858 that sparked the Pike’s Peak Gold Rush. Since then, gold mining has been a major industry in Colorado, with significant lode and placer discoveries throughout the state. Over 1 million ounces of gold has come out of Summit County in central Colorado, both as lode and placer deposits. The Breckenridge District is one of the richest areas in the state, with an abundance of gold placer mined from the creeks, and much of the gold production from this area come from hydraulic mining the rich bench gravels. Gold dredging operations occurred on the Blue River and Swan River. Dredge piles are still present to this day, along with remnants of the old bucket line dredge. The Frisco District also produced some gold, although much has come as a byproduct of other mining operations. Nearby in Park County, over a million ounces of gold have also been recovered. Although most gold found here was from lode mining, the Fairplay District was a rich placer area at the headwaters of the South Platte River and the nearby streams. Many waters on the east range of the Mosquito Mountains have gold present. Bucket line dredges also worked the South Park Valley during the mid 1900’s. The Tarryall District which included Tarryall Creek and several other small creeks also added to the gold output of the county. Gilpin County is an excellent area to search for gold. Located just west of Denver, this county has been one of the richest in the state. Central City Mining District has produced over 4 million ounces of gold, with the vast majority coming from lode deposits. Searching ore dumps with a metal detector may be productive in this area. Although placer production was much less, many thousands of ounces came from this county, so further prospecting is certainly worthwhile. Chicago and Clear Creeks near Idaho Springs were especially productive, and were also the location that started the gold rush to Colorado. To the south, Teller County is home to the Cripple Creek District, one of the richest gold areas in the U.S., and the leading gold producer in Colorado. Numerous large mines can be found here, all of which produce lode gold. The Cripple Creek and Victor Gold Mine still operates. Placer deposits are less well known, but further exploration by modern day prospectors may very well be productive. In the southwest part of Colorado in San Miguel County, gold is a significant byproduct of several copper, lead, and silver mines. The Telluride District in the far southeastern part of the county, numerous mines have contributed to a total output of over 3 million ounces of gold. Although overall output was much less, several small placers can be found throughout the county. Locating areas with historic placer mining may be more productive for the modern day prospector, as much of the low grade gold ores require special recovery methods that are only economically feasible for large mining companies. Lake County has numerous placer locations along the Arkansas River and several tributaries. Search for the telltale signs of historic placer workings. The Leadville District is full of numerous mines, including many streams and gulches that were mined. The counties listed above mention some of the largest gold producing districts in Colorado, but be aware that nearly all the areas in the central and western part of Colorado are worthy of investigation for the modern day gold prospector. Literally millions of ounces of gold have come from this state, and it is likely that many millions of ounces still await discovery. Colorado’s rugged terrain ensures that much gold will remain in its hillsides, streams, and rivers. A prospector equipped with a shovel, pick and gold pan has a good chance of finding good gold. A high quality metal detector may also be productive to search the discarded ore piles of old abandoned mines, as veins of gold in quartz can often be found.